Rabbi Zehavi joined Congregation Agudat Achim in July 2017, drawn by its warm and caring community. You might say that his journey to the rabbinate began when, at age four, he declared that he wanted to be a rabbi and a scientist “to understand the world from different perspectives”. Dialogue between contrasting views is still something he appreciates in traditional Jewish study. Born in Brookline, he grew up in Israel, Florida, and Maryland. After receiving his Bachelor’s degree in philosophy and human rights from Columbia University, he returned to Israel to fulfill his military service, study, and work. He studied law at the Hebrew University of Jerusalem and engaged in Jewish text learning at the Pardes Institute and the Conservative Yeshiva. He and his wife, Ashira, led a vibrant prayer community in Jerusalem that combined traditional liturgy with original music and instrumentation. Rabbi Zehavi has a love of Israeli and Middle Eastern culture and music. While a law student, he learned to play oud (though he could use some practice). He has benefited from exposure to Jewish communities from different denominational and cultural backgrounds and appreciates the gifts that each tradition offers the Jewish people today. Rabbi Zehavi is completing his rabbinical studies at Hebrew College in Newton. He recently taught Jewish studies at Makor, a community supplemental program for middle schoolers, and the Jewish Discovery Institute, which offers educational and experiential learning opportunities for those exploring Judaism. He has also led adult text study in Jewish and interfaith settings. 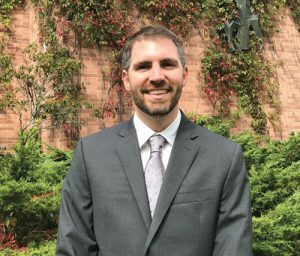 Rabbi Zehavi is excited to bring his love of music, prayer, Torah, and Jewish life to Agudat Achim. He, Ashira, and their two young boys are happy to join the community and are touched by its warm welcome! In their spare time, they are looking forward to growing their vegetable and herb gardens and exploring nearby ski locations.